Women and children sing in higher keys than men. When we attempt to learn to accompany ourselves, we need – but struggle to find – arrangements suitable for our vocal range. Nearly everyone loves to sing. Many of us girls pick up a guitar or ukulele at some point, just to give self-accompaniment a try. Some stick with it and manage to learn a good number of chords but soon find out that real growth only comes through frequent practice and performance. And for that, we need “material” – specifically, a library of songs that enable us to practice playing and singing at the same time. If we hope to be able to perform a few songs – even in the most modest of settings – we find we benefit from maintaining a song list of some sort. We quickly catch on to the value of a meaningful and varied repertoire, but it’s hard to find many resources that show us where to find great songs to sing and coach us on how to play them. When we take lessons, we expect to learn cool tunes that will help us build skills both as singers and as accompanists; yet we often discover that even the best music teachers will have trouble finding enough vocal material to help us girl singers achieve real rhythm guitar or uke fluency. Lyric sheets downloaded from the internet are usually a dead end key-wise, or the arrangements are incomplete or complicated beyond our level of ability… and many times, they’re just not accurate. As students, it’s here we can lose our momentum. But Folkslingers bears some good news. 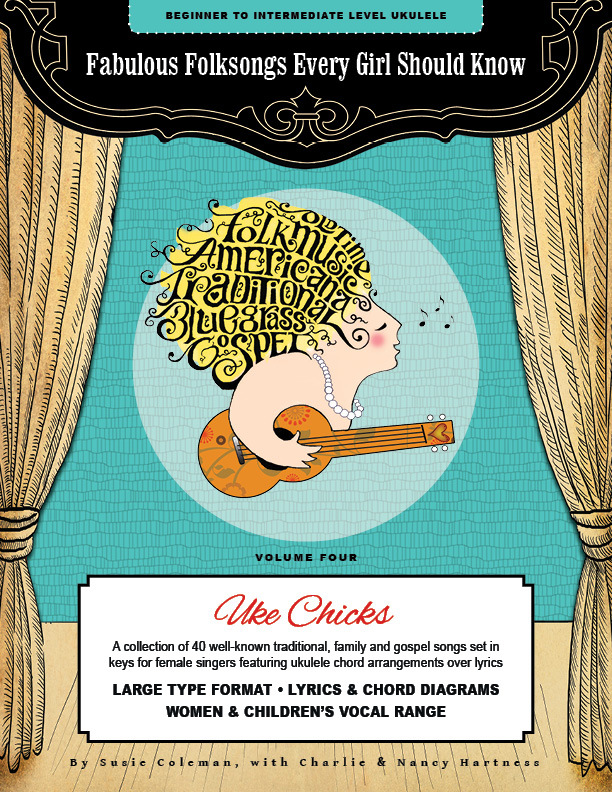 Ladies hungry for guitar/ukulele/vocal music should check out Fabulous Folksongs Every Girl Should Know, four songbooks full of tunes well-known to American singers for generations. Because… hold on to your mascara… the arrangements are in keys for a female voice. 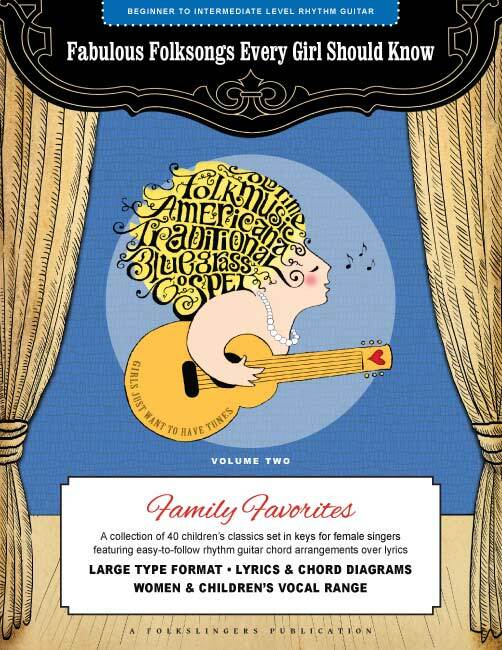 Four volumes of wonderful old songs people still play today. There’s even a ukulele version! Folkslingers.com presents a library of traditional songs arranged for the rhythm guitar set in higher singing keys. Everything you need to know to learn a tune is at hand: chord diagrams, full lyrics, and chord changes marked in all the right places. If you know the melody, you’ll easily nail the song after a couple practice sessions. While you will not likely perform Three Blind Mice in front of anyone but your grandchildren, playing this easy tune – while singing out loud or in your head – is a skill builder for both the right and left hand. 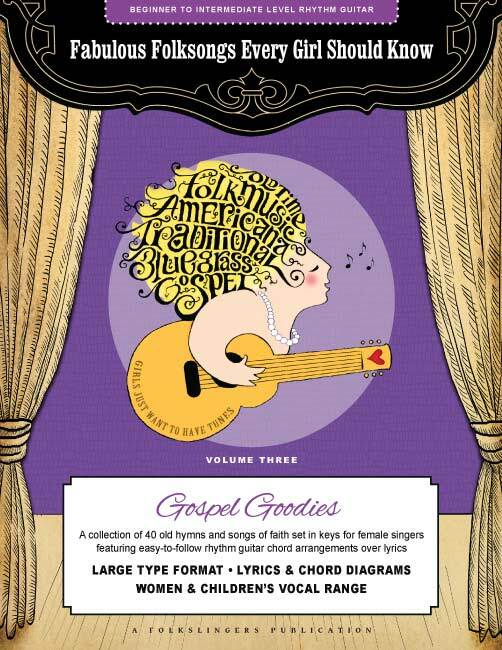 Each songbook offers more advanced arrangements as well as simple ones to help you master self-accompaniment. Not sure of the melody? No problem. We have videos. It helps to know the melody prior to learning a song; it should be your very first concern when exploring a new tune. Some of the beginner songs in our collection you will recognize (such as The Farmer In The Dell) and others you might have heard of but never sang before. 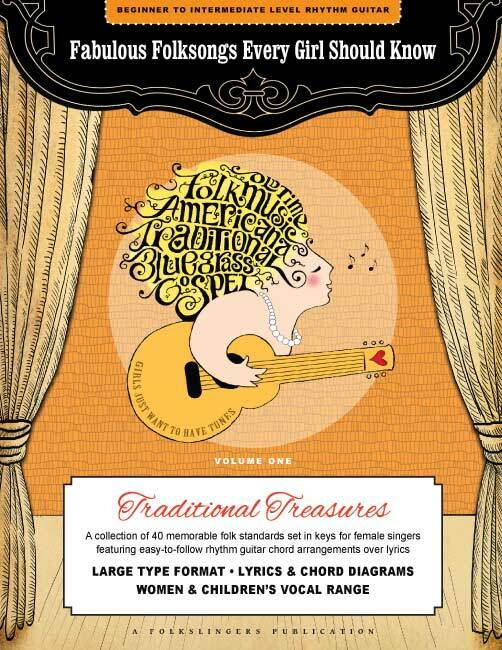 To help you learn melodies, Folkslingers has created a library of YouTube videos related to every song in our Fabulous Folksongs Every Girl Should Know collection so you can study the vocals and get inspired by various arrangements. There is a page on this website dedicated to every song that appears in our songbooks. Folkslingers is extremely grateful to YouTube and to our musical heroes who appear in and/or host the videos featured on our site.